The second phase of Buddhism developed about 300 years after the Buddha’s death, and described itself as The Great Way (Mahāyāna). As you can see by the length of this page, the Mahāyāna is a large and complex tradition, and so it is not easily summarised. One emphasis in many schools of this tradition is a shift away from the spiritual goal of saving yourself from suffering, and towards a new goal of developing yourself so that you can help everybody to become free from suffering. Someone who practices in this way is known as a Bodhisattva, a word that isn’t usually translated but literally means 'Enlightenment Being'. The Mahāyāna saw the development of new Buddhist texts and a number of sophisticated ways of thinking about experience and how to become Enlightened. These texts are deliberately paradoxical, constantly contrasting our superficial experience of the world, with the way in which, in reality, all experience and phenomena are in a constant flow of ongoing change. Amongst these texts is the Diamond Sutra, a copy of which is the oldest printed book in the world (you can see the scroll on the British Library website, although unfortunately the library’s comments about Buddhism are rather inaccurate). Another well-known Prajñāpāramitā text is the profound and beautiful Heart Sutra. Mādhyamika philosophy was traditionally founded by the sage Nāgārjuna, and developed out of the Perfection of Wisdom texts. It argued that since everything is in a constant process of change then there is nothing that can be said to genuinely exist. This stuff is a bit head-mangling, but it's just a rigourous application of the fundamental Buddhist teaching that all things arise in dependence on conditions (pratītyasamutpāda). The Yogācāra emphasises that all of our experience is mediated through our consciousness or mind, hence it's alternative names of Vijñānavāda ('the way of consciousness') and Citta-mātra ('mind only'). Consequently, we need to work on the mind in profound meditation (yoga) to achieve Enlightenment through a 'turning around in the deepest seat of consciousness'. The Yogācāra analysis of eight aspects of consciousness is rather too complex and subtle to go into here. It is possible to see the development of the Tathāgatagarbha doctrine as a reaction to the perceived negativity of the Mādhyamaka, as it emphasises that all sentient beings possess the potential for Enlightenment. Initially this was expressed poetically, but as time went on a kind of theoretical rationalisation developed, pointing out that since all phenomena are equally empty, then there is no essential difference between our unenlightened consciousness and the Enlightened consciousness of a Buddha. Unfortunately this is open to the misinterpretation that we are already Enlightened! Indian Buddhism died out in the 11th century CE following the Muslim incursion, and Tibetan Buddhism developed into the Vajrayana tradition, so the existing Mahāyāna traditions are largely found in the far east. Perhaps the best known of Buddhist traditions, the name Zen is the Japanese form of the Chinese word Ch’an, which is itself the Chinese form of the Sanskrit word dhyāna. Dhyāna’s usual English translation is meditation, so Zen is a Buddhist tradition that focuses on meditation. Rinzai emphasises reflection on paradoxical riddles called kōans to break through habitual ways of thinking and understanding. ‘What is the sound of one hand clapping?’ is a simplified form of a famous kōan. Sōtō, was introduced to Japan by Dōgen, and emphasises the practice of Shikantaza (just sitting) meditation. Mahāyāna texts introduced the idea of an environment that is ideal for spiritual development, the Pure Land, some of which are described in fantastical detail in a number of texts. Pure Land Buddhism argues that the teaching and practice of Buddhism have degenerated to the point that it is no longer possible to gain Enlightenment, and so the goal of practice should be to be reborn in a Pure Land, in which spiritual development is guaranteed. 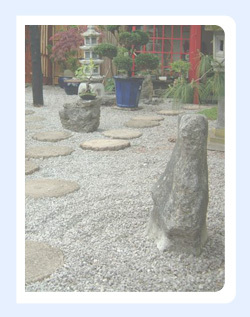 The Japanese Pure Land school (Jōdo shū) was founded by Hōnen in the 12th century. The tradition is based on devotion to the archetypal (i.e. not historical) Buddha Amitābha, who is believed to have made a vow that he would not become a Buddha unless all beings who recite his name are reborn in his Pure Land, Sukhāvatī. Logically, since Amitābha is now a Buddha, then this vow must have been fulfilled, and so the main practice in Pure Land Buddhism is to chant a verse in appreciation of Amitābha (the Nembutsu). The Jōdo Shinshū (True Pure Land School), founded by Shinran, went a step further and argued that chanting the Nembutsu with a desire to be reborn in Sukhāvatī was an act of the ego, and consequently counterproductive. Instead it should be chanted as an expression of gratitude to Amitābha (Amida in Japanese). The Japanese monk Nichiren also believed that Buddhism was in decline, so much so that he decided that the only true practice was the reverence of the White Lotus Sutra. The central practice in this tradition is the chanting of a homage to the sutra 'Nam Myōhō Renge Kyō', known as the daimoku. If you’d like to know more about Mahāyāna Buddhism I recommend my friend Nagapriya’s recently published book Visions of Mahāyāna Buddhism. Early Buddhism: The Buddha's original teachings and the oldest surviving school. 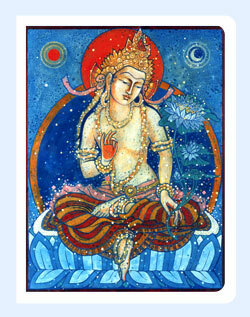 The Vajrayana: The Diamond Way, magical perspectives of Tantric Buddhism, the third phase of Buddhist development.